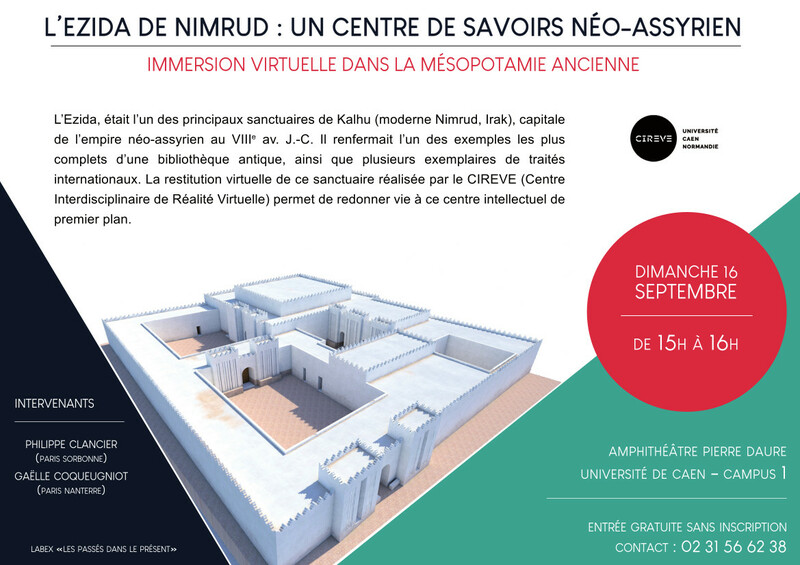 We are pleased to invite you to a presentation of Nimrud's Ezida and its 3D reproduction by Philippe Clancier et Gaëlle Coqueugniot for the European Heritage Days. Nabu's sanctuary, called Ezida, was one of the principal sanctuaries of Kalhu (contemporary Nimrud, Irak), capital city of the Neo-Assyrian empire during the 8th century BC. Plundered in 612 BC, it included one of the most comprehensive example of ancient library discovered in sity, as well as several specimens of international treaties kept there by assyrian kings. The virtual reproduction of this sanctuary enables us to better understand this remarkable intellectual center, whose high walls were preserved during the excavations of 1956-1957.